SLC specializes in speedy door-to-door courier transit of time-sensitive business materials. Once our SLC driver picks up your shipment, we manage every detail of its movement, and into the hands of your recipient. For trade fair exhibitors SLC offers a safe, convenient way to transport materials and displays to virtually and destination city. Wherever the venue, SLC will carefully ship your booth displays, literature, and supplies, and ensure on time delivery to your convention site or hotel. Sugar Land Courier Services offers several easy-to-use tools that illustrate the range of available delivery times and pricing options for your shipments. These tools also provide you with a selection of service options that meet your shipping needs. 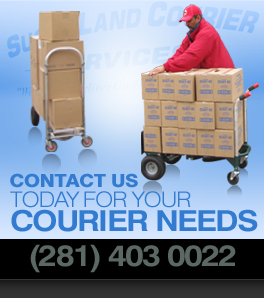 Whether you are shipping one package or a hundred, for business purposes or personal reasons, far away or close to home, Sugar Land Courier Services offer a wide range of service options designed to meet your shipping needs. Holidays, weekends, anytime… That’s when Sugar Land Couriers is available for pickup and delivery of your important cargo. Need company mail picked up and delivered to another location? WE DOIT! Need court documents filed in this or another county? WE DO IT! In fact, our services include packing and shipping, air freight forwarding, warehousing, building crates for shipments, out-of-state deliveries, and much more. Whether you entrust Sugar Land Couriers with the delivery of a single envelope containing important documents, or a large cargo shipment filled with valuable goods, our goals is to get it to its destination on-time and in good condition: day or night!